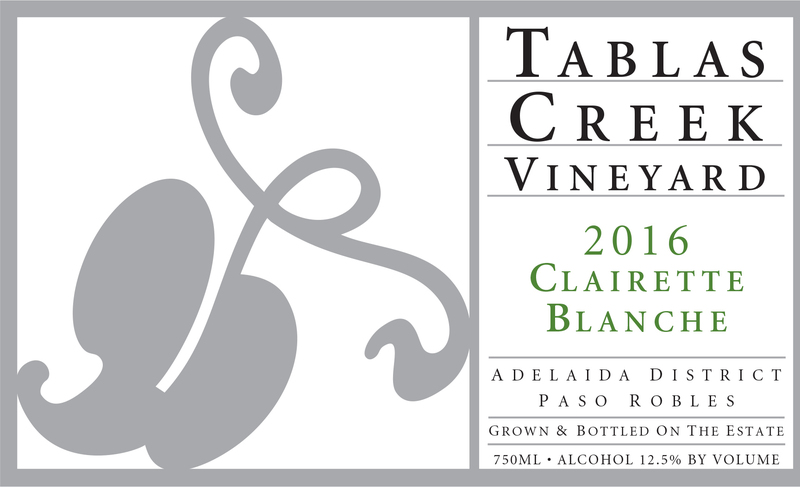 The Tablas Creek Vineyard 2016 Clairette Blanche is the fourth varietal bottling of this unique estate-grown varietal, propagated from budwood cuttings from the Château de Beaucastel estate. The 2016 Clairette Blanche has aromas of pineapple, key lime, and mint. In the mouth, it stands right on the edge between sweet and tart, with flavors of kaffir lime, green plum, and lemongrass. The finish is clean and slightly nutty, with an anise note. Clairette Blanche, once one of the most widely planted white grapes in the Rhone, saw decades of decline before a recent resurgence of interest thanks to its ability to maintain freshness in a warming climate. We imported it into the United States in 2003 as part of our goal to have all the Chateauneuf du Pape varieties. It was released to us in 2009, planted in 2010, and its first harvest was 2013. Our small (half-acre) block on our certified organic estate vineyard is one of the only ones in California. The 2016 vintage, while still marked by drought, saw better rainfall than the four previous years, and the vineyards showed good health through most of the growing season. That season started with a very early budbreak and continued warm weather spurred our earliest-ever beginning to harvest, on August 18th. But beginning mid-August, three cool weeks slowed the ripening for all but our earliest grapes, and allowed them to reach flavor and phenolic maturity with slightly above-average hang time. The resulting vintage shows excellent concentration but also remarkable vibrancy, with electric acids framing appealing juiciness. The Clairette Blanche was harvested on the 15th of September. The fruit was whole cluster pressed, and fermented with native yeasts in a small variable capacity stainless steel fermenter until bottling in June 2017.